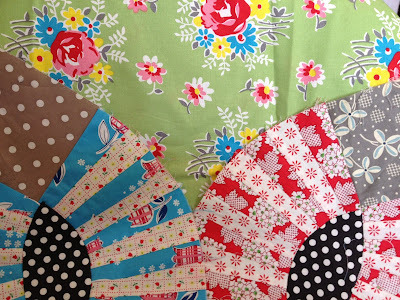 I'm to the point in my Gypsy Kisses quilt where I need to audition fabric for the background. 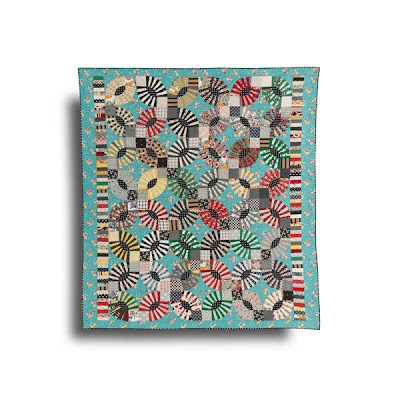 I've really tried to stick to the original feel of the quilt. But I'm not sure about the piano key edges. I just don't know about that yet but I will probably stay true to that format. 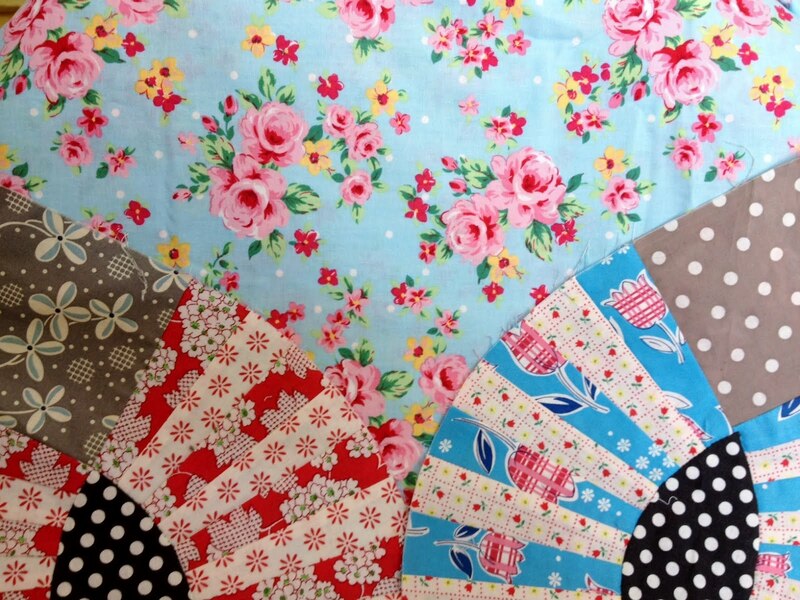 Which of the 4 fabrics below do you like best for the Gypsy Kisses background? This is #1. This is the fabric I originally purchased to go with the quilt. This is fabric #2. It is a different color but sticks to the roses background from the original. This is a paler version than the blue. 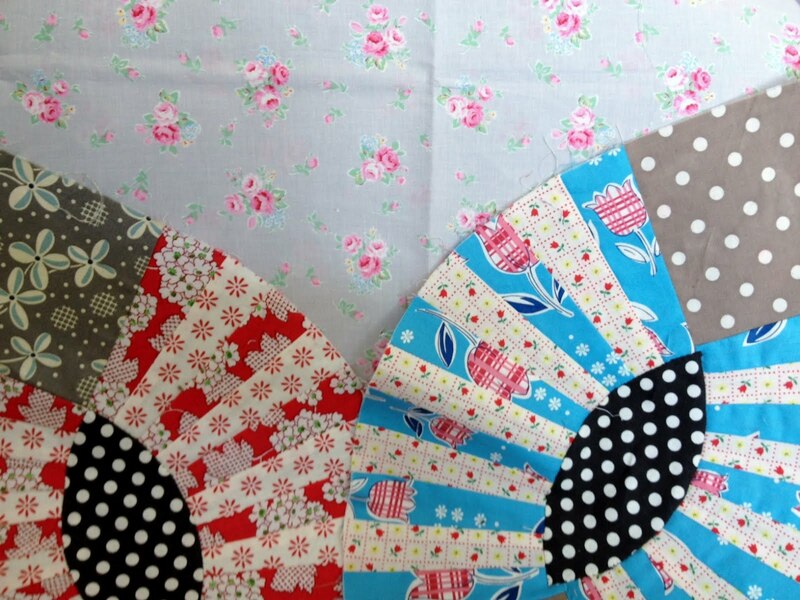 The gray also has the roses and may tone down the busy colors in the quilt. 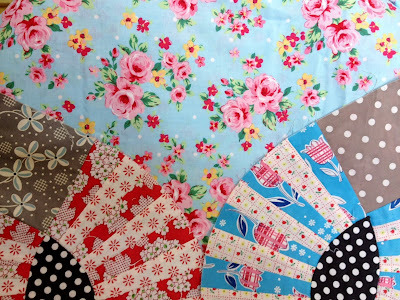 This is PKM fabric that again has the roses. The blue is a different intensity than the original. I'm pondering on the pattern still. I really don't know how long it will take me to finish up this quilt. I'm not in a rush. I have a dozen other projects I'm working on. So I think pondering and poking at it is okay. Who knows? I may not even use any of the above fabrics for the quilt. But which is your favorite? It's number two for me Nanette. Whatever you chose of the four, it's going to be gorgeous. I like one or two. I have the green Denyse Schmidt one and I adore it. Ok so I'm leaning toward that one. :-) It's beautiful so far!! I vote for #1 !!! Hard choice by the way, I don't blame you for wanting to thin it over for awhile !! You are much better with brave choices than I am but my faves are 1 and 2. The only one I dd not like was the blue PKM (just for this project, not overall as a fabric). I like the first choice. The blues are complimentary and the the red pops, at least on my screen. I'm glad I'm not alone in second guessing. I'm sure it will be fabulous which ever one you choose. Tough choices really... I favour the last two pictures. Think that the original fabric the pink roses are too dominant decapitation the blue being beautiful. I like number two, because it pulls in the gray . . .I think the green makes everything POP! I like the green in number 2.. but I like the smaller more spread out print in the last two choices. Hmm. That is a tough one! Have fun playing with it until you decide. Can't wait to see it done. I'm sure it will be beautiful, whichever fabric you choose! green background of number two. Gotta be #1 or #2 in my humble opinion. The print is too small for the quilt with the lat two. Gypsies are known for big personalities and being daring and doing things in their own way. So to me, that calls for a larger scale print :) When I get down to this one on my to make list- it will have a large print background :) Love your options!! Good luck- as long as you smile when you see it, that is enough! I think I like the third one. I'm partial to the green one! I like the last one... the brighter blue matches the brighter colors of the eyes I think. I'm sort of partial to the first one. #3. it is pale and soft which makes the grey and black pop. that's what i would want. those Australians though are much braver than i am. #2 for me too Nanette. It has the perfect contrast. My vote is for #2 - I just love that print. I feel like it still has the integrety of the original, but with a bit of a unique, Nanette, twist. But really any of your choices will be lovely. Can't wait to see it! Okay, my first instinct was #3. Nice and subtle, really emphasizing those Kisses. Of course after looking at them longer, #2 is nice :) I still think I would stick with the paler one though. Either way, the "blocks" look great! I like the green one best! I like your original first choice best. My choice would be #3. Not as busy, will bring out the applique colors. I really like the gray one. Seems like the elipses will really pop out with that background. Can't wait to see this one finished! It's beautiful! # 1 just love it. Number one for sure! I like that! I will come bail you out of jail. I like the greeen or the last blue...very neat and colorful. I am new to your blog and just discovered it from another...as I scrolled through I see your sweet granddaughter is a preemie...what a cutie. My son was born at 32 weeks. He spent 6 weeks in the NICU. It's a tough place and my heart goes out to you and your daughter. Thankfully, they are so good and given Eliza's birthweight...that is good. Just for information, after 4 weeks in the NICU, I began to think we'd never get out of there b/c the strick feeding goals. 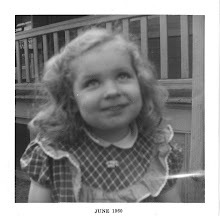 The only person who was a consistent care provider was a speech therapist...dr and nurses changed all the time. After observing my son weak duration for sucking and my personal nursing she advocated for the dr to relax the feeding schedule for 2days and let me nurse at will. It worked and they release him after 6 weeks total but he never had the strength to complete the 7 bottles a day. He nursed fine and kept the weight on. Everyone stories are different. Your dear Eliza is such a gift. Know I will remember your family in our prayers, knowing the NICU experience is challenging for everyone...hopefully soon she will come home! I like the green and the grey. Whatever you choose will be lovely. You have such a great eye for color. As much as I love my pkm I think the #2 green is pretty nice. Hard to tell with just the two segments but it seems the right intensity and color. BUT whatever you choose it will be awesome right? That's a pretty hard decision. Any of them would be great. From here, it looks like number three would show off the piecing better though. 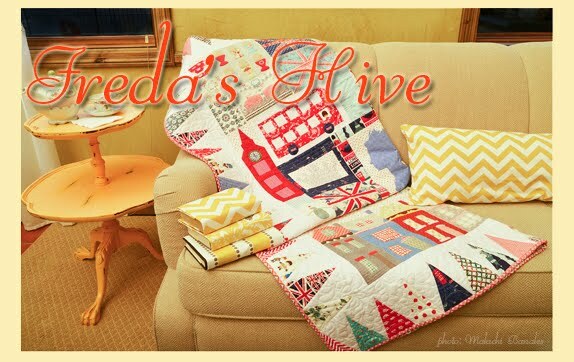 Isn't it good that you can make it totally your own, with your own taste and pretty fabrics! I love the green fabric, it shows the design off well. I like them all but #2 really makes an impact. It has just enough grey to pick up the grey in your blocks, yet doesn't fight with your other fabrics. I love #3 but it is too pale and I think the other 2 tend to overwhelm your blocks. Just my take on it. I think you did best with your original pick. Number 1 is my favorite! 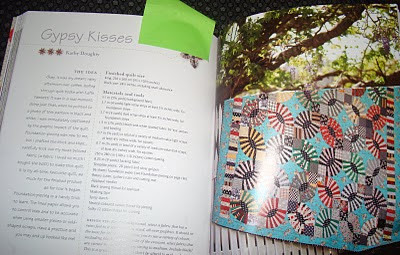 #1 is closest to the quilt shown in the book but.... I like the green because it contrasts so nicely with the reds shown in the blocks you shared with us. I vote for #1. Love Gypsy Kisses! I like #3 the pale gray. Gray is the new neutral these days. Also, I wanted to thank you for talking about the mobile wood fire pizza in Hurricane Utah last year. I didn't see the cart last year, but my friends and I drove by it this week as I screamed out "there is the wood fire pizza, I've been talking about." We stopped even though we just had yogurt and had ordered a pizza to bake back at our vacation home. But it was a once in a life time experience, so we ordered a pizza and ate it on the spot. It was the best pizza!! I told the pizza-man I read about it on your blog! Thanks for turning us on to that, we'll look for him next year when we're back in St. George. 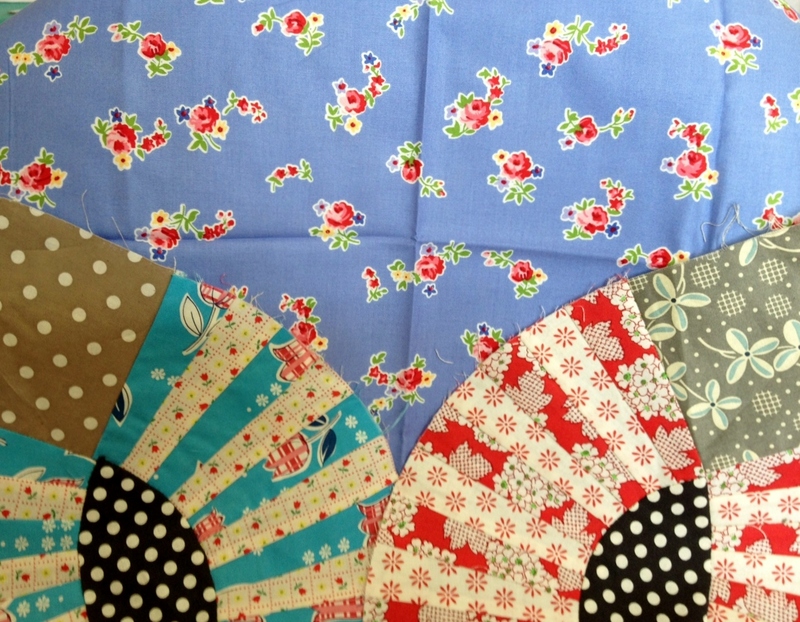 I think the PKM fabric would be beautiful! Oh boy. I really like number one. Which is your favorite? :o) I look forward to seeing which you decide. Am I too late...#3 is my first choice and #1 is my second choice...but sometimes it's hard to tell from just a photo! I know you'll pick the best one! Good luck with choosing. Looks like you have votes for all four. I alway lean to happy, bright colors so my vote would be #1. What is up with me today? My shower curtain.